A quick, granular and accurate search interface is of prime importance for most web applications today. Many have traditional search interfaces where the scope of search is restricted to specific fields; thus limiting the ability to get relevant search results. However, most commercial web sites will require an advanced search interface that will index the content of documents, build complex queries based on multiple criteria and fetch maximum results. In this paper, we introduce the Apache Solr Search Engine that will, most importantly, provide content search, explain how to construct queries involving multiple search criteria using Solr and integrate with the application to build a quicker, accurate and more refined search interface. Apache Solr is an open source enterprise search server, based on the Lucene Java search library, with XML/HTTP and JSON APIs. It runs in a Java servlet container, such as Tomcat. Input to Solr is the document with optional metadata. We put documents in it (called as indexing) via XML, JSON, CSV or binary over HTTP. We query it via HTTP Get and receive XML, JSON, CSV or binary result. It is architected to deliver very fast search operations across wide variety of data. Advanced full-text search – Users can search for one or more words or phrases in the content of documents, specific fields, or combinations of one or more fields, thus providing results that match user’s interests. Faceted Search – User can narrow down the search results further by applying filters on the fields (numeric, date fields, unique fields) if the user wishes to drill down. Thus providing categorized search. Sort – User can prioritize the search results based on field count. Pagination – User can display the search results in pages of fixed size. Hit-Term Highlighting – Provides highlighting of the search keyword in the document. Admin UI – It has a very simple and user-friendly interface for designing and executing queries over the data. Caching – It caches the results of filter queries, thus delivering faster search operations. PageIndex: This is used for pagination to specify the offset for query’s results set. It will instruct Solr to display results from this offset. To get search results for keyword “twitter” we will enter the keyword in the “Query String” textbox of Solr Admin UI and hit the Search button. Solr will by default order the search results based on the relevancy score that is calculated to determine how relevant a given Document is to a user’s query. The more times a query term appears in a document relative to the number of times the term appears in all the documents in the collection, the more relevant that document is to the query. Thus the priority of the search results will always be on track unless one explicitly gives a sort parameter in the search query. Online schema changes Schema change requires restart. Workaround possible using MultiCore. Only backward-compatible changes. Structured Query DSL Need to programmatically create queries if going beyond Lucene query syntax. Faceting The way top N facets work now is by getting the top N from each shard, and merging the results. This can give incorrect counts when num shards > 1. Negative boosting but awkward. Involves positively boosting the inverse set of negatively-boosted documents. Automatic failover If all nodes storing a shard and its replicas fail, client requests will fail, unless requests are made with the shards.tolerant=true parameter, in which case partial results are retuned from the available shards. Automatic shard rebalancing it can be machine, rack, availability zone, and/or data center aware. Arbitrary tags can be assigned to nodes and it can be configured to not assign the same shard and its replicates on a node with the same tags. Change # of shards specified at index-creation time, with command-line param -DnumShards=n. Cannot be changed once index is created. Shard splitting is a work in progress (SOLR-3755). Additional replicas can be created. each index has 5 shards by default. Number of primary shards cannot be changed once the index is created. Replicas can be increased anytime. Consistency Indexing requests are synchronous with replication. A indexing request won’t return until all replicas respond. No check for downed replicas. They will catch up when they recover. When new replicas are added, they won’t start accepting and responding to requests until they are finished replicating the index. Replication between nodes is synchronous by default, thus ES is consistent by default, but it can be set to asynchronous on a per document indexing basis. Index writes can be configured to fail is there are not sufficient active shard replicas. The default is quorum, but all or one are also available. As a number of folks point out in the discussion below, feature comparisons are inherently shallow and only go so far. I think they serve a purpose, but shouldn’t be taken to be the last word on these 2 fantastic search products. If you’re running a smallish site and need search features without the distributed bells-and-whistles, I think you’ll be very happy with either Solr or ElasticSearch. The exception to this is if you need RIGHT NOW some very specific feature like field grouping which is currently implemented in Solr and not ElasticSearch. Because of the considerable momentum behind ElasticSearch, it is very likely that the feature-set between the 2 products will converge considerably in the near future. If you’re planning a large installation that requires running distributed search instances, I suspect you’re going to be happier with ElasticSearch. As Matt Weber points out below, ElasticSearch was built to be distributed from the ground up, not tacked on as an ‘afterthought’ like it was with Solr. This is totally evident when examining the design and architecture of the 2 products, and also when browsing the source code. The Solr wiki and the ElasticSearch Guide are your friends. Note: Throughout this document the reference [Tomcat install dir] is the directory where Tomcat is installed. Typically, this is C:\Program Files\Apache Software Foundation\Tomcat 7.0 or C:\Program Files (x86)\Apache Software Foundation\Tomcat 7.0. Open [Tomcat install dir]\tomcat-users.xml for editing. Open [Tomcat install dir]\webapps\solr\WEB-INF\web.xml for editing. “solr” in the path is the name of the instance you want to secure. Typically this is “solr,” but may be different if you are running an advanced setup. Save the changes and restart Tomcat. Test your changes by starting a new browser session and navigating to your site, for ex. http://localhost:8080/solr/. You should be prompted for credentials. Download the following communityserver_override.config file. Place this file in the root of your Web site directory. You can work with your IT department to limit connections, but in the case this is not an option you can enforce connection rules using Tomcat configuration. Open the solr.xml file in [Tomcat Install Dir]/conf/Catalina/localhost/. Create the file if it does not exist. The name of the file should match your instance name. A typical setup is running Solr at http://localhost:8080/solr, so the file should be named solr.xml (all lowercase, case-sensitive characters). If you set up Solr to run at a different location, e.g., http://localhost/solr1, the file must be named solr1.xml. Add the following snippet to the file, but update the docBase value with the path to where your solr.war file resides. Typically this would be [Tomcat install dir]/webapps/. <Context docBase="C:\Program Files\Apache Software Foundation\Tomcat 6.0\webapps\solr.war"
Save your work and restart Tomcat. In text retrieval, full text search refers to techniques for searching a single computer-stored document or a collection in a full text database. Full text search is distinguished from searches based on metadata or on parts of the original texts represented in databases (such as titles, abstracts, selected sections or bibliographical references). In a full text search, the search engine examines all of the words in every stored document as it tries to match search criteria (e.g., words supplied by a user). Full text searching techniques became common in online bibliographic databases in the 1990s. Many web sites and application programs (such as word processing software) provide full-text search capabilities. Some web search engines such as AltaVista employ full text search techniques while others index only a portion of the web pages examined by its indexing system. When dealing with a small number of documents it is possible for the full-text search engine to directly scan the contents of the documents with each query, a strategy called serial scanning. This is what some rudimentary tools, such as grep, do when searching. However, when the number of documents to search is potentially large or the quantity of search queries to perform is substantial, the problem of full text search is often divided into two tasks: indexing and searching. The indexing stage will scan the text of all the documents and build a list of search terms, often called an index, but more correctly named a concordance. In the search stage, when performing a specific query, only the index is referenced rather than the text of the original documents. The indexer will make an entry in the index for each term or word found in a document and possibly its relative position within the document. Usually the indexer will ignore stop words, such as the English “the”, which are both too common and carry too little meaning to be useful for searching. Some indexers also employ language-specific stemming on the words being indexed, so for example any of the words “drives”, “drove”, or “driven” will be recorded in the index under a single concept word “drive”. This diagram represents a low-precision, low-recall search as described in the text. Recall measures the quantity of results returned by a search and precision is the measure of the quality of the results returned. Recall is the ratio of relevant results returned divided by all relevant results. Precision is the number of relevant results returned divided by the total number of results returned. The diagram at right represents a low-precision, low-recall search. In the diagram the red and green dots represent the total population of potential search results for a given search. Red dots represent irrelevant results, and green dots represent relevant results. Relevancy is indicated by the proximity of search results to the center of the inner circle. Of all possible results shown, those that were actually returned by the search are shown on a light-blue background. In the example only one relevant result of three possible relevant results was returned, so the recall is a very low ratio of 1/3 or 33%. The precision for the example is a very low 1/4 or 25%, since only one of the four results returned was relevant. Due to the ambiguities of natural language, full text search systems typically includes options like stop words to increase precision and stemming to increase recall. Controlled-vocabulary searching also helps alleviate low-precision issues by tagging documents in such a way that ambiguities are eliminated. The trade-off between precision and recall is simple: an increase in precision can lower overall recall while an increase in recall lowers precision. Free text searching is likely to retrieve many documents that are not relevant to the intended search question. Such documents are called false positives. The retrieval of irrelevant documents is often caused by the inherent ambiguity of natural language. 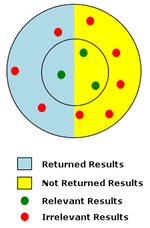 In the sample diagram at right, false positives are represented by the irrelevant results (red dots) that were returned by the search (on a light-blue background). Clustering techniques based on Bayesian algorithms can help reduce false positives. For a search term of “football”, clustering can be used to categorize the document/data universe into “American football”, “corporate football”, etc. Depending on the occurrences of words relevant to the categories, search terms a search result can be placed in one or more of the categories. This technique is being extensively deployed in the e-discovery domain. The deficiencies of free text searching have been addressed in two ways: By providing users with tools that enable them to express their search questions more precisely, and by developing new search algorithms that improve retrieval precision. Keywords. Document creators (or trained indexers) are asked to supply a list of words that describe the subject of the text, including synonyms of words that describe this subject. Keywords improve recall, particularly if the keyword list includes a search word that is not in the document text. Boolean queries. Searches that use Boolean operators (for example, “encyclopedia” AND “online” NOT “Encarta”) can dramatically increase the precision of a free text search. The AND operator says, in effect, “Do not retrieve any document unless it contains both of these terms.” The NOT operator says, in effect, “Do not retrieve any document that contains this word.” If the retrieval list retrieves too few documents, the OR operator can be used to increase recall; consider, for example, “encyclopedia” AND “online” OR “Internet” NOT “Encarta”. This search will retrieve documents about online encyclopedias that use the term “Internet” instead of “online.” This increase in precision is very commonly counter-productive since it usually comes with a dramatic loss of recall. Concept search. A search that is based on multi-word concepts, for example Compound term processing. This type of search is becoming popular in many e-Discovery solutions. Concordance search. A concordance search produces an alphabetical list of all principal words that occur in a text with their immediate context. Proximity search. A phrase search matches only those documents that contain two or more words that are separated by a specified number of words; a search for “Wikipedia” WITHIN2 “free” would retrieve only those documents in which the words “Wikipedia” and “free” occur within two words of each other. Regular expression. A regular expression employs a complex but powerful querying syntax that can be used to specify retrieval conditions with precision. Wildcard search. A search that substitutes one or more characters in a search query for a wildcard character such as an asterisk. For example using the asterisk in a search query “s*n” will find “sin”, “son”, “sun”, etc. in a text. The PageRank algorithm developed by Google gives more prominence to documents to which other Web pages have linked. The following is a partial list of available software products whose predominant purpose is to perform full text indexing and searching. Some of these are accompanied with detailed descriptions of their theory of operation or internal algorithms, which can provide additional insight into how full text search may be accomplished. SOLR : What is schema.xml ? This attribute is responsible for telling filters how to behave when dividing tokens. Some filters (such asWordDelimiterFilter) can divide tokens into a set of tokens. Setting the attribute to true (default value) will automatically generate phrase queries. This means that WordDelimiterFilter will divide the word “wi-fi” into two tokens “wi” and “fi”. With autoGeneratePhraseQueries set to true query sent to Lucene will look like "field:wi fi", while with set to false Lucene query will look like field:wi OR field:fi. However, please note, that this attribute only behaves well with tokenizers based on white spaces. termVectors – set to true in the case when we want to keep so called term vectors. The default parameter value is false. Some features require setting this parameter to true (eg MoreLikeThis orFastVectorHighlighting). You are currently browsing the SOLR category at Naik Vinay.